Protecting any electronic device I own is something I take very seriously. I mean, let's face it, we all know that anything electronic can cost a pretty penny and can contain valuable information. Now, maybe I've put the proverbial cart before the horse here, but I've definitely got an iPad on my Christmas list this year for Santa. Of course, if I've been a good girl and Santa brings me an iPad, protecting it properly will be job number ONE! There are a lot of different options out there for iPad cases, but I think I've found a real winner in the Targus Z-Case Leather Portfolio for iPad. Keep reading to find out why the Z-Case is tops with me! 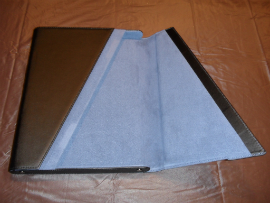 I reviewed the Z-Case Leather Portfolio for iPadfrom Targus, which retails for $54.99. FREE SHIPPING on orders of $65 or more OR 50% off shipping for orders under $65! The first feature that really struck my fancy with the Targus Z-Case was the overall design and look of the case. I've come across many cases which look very juvenile because of the bright, neon colors or loud patterns used. This may be perfectly fine for a high school or college student, but I wanted something which looked more sophisticated. 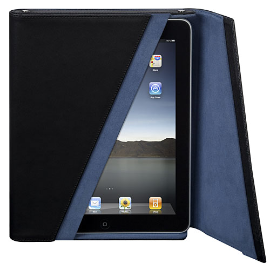 The Targus Z-Case has a hard-shell, black leather exterior which provides a protective frame for your iPad. I love cases like this, because I just don't trust soft cases when it comes to real protection. I don't see how anything without a hard inner shell can stop your electronic device from being damaged under the weight of other items you may be carrying. View of the soft, interior lining of the Z-Case and unique angled opening. Next, I love the stylish blue diagonal across the front of the Z-Case, which is really just a peek at the Z-Case's interior lining. As you can see in the picture below, the Targus Z-Case is opened, not with zippers or Velcro, but by lifting the small tab on the bottom of the case and releasing the magnetic closure. I am also a fan of the magnetic closure feature, but will admit that this closure is not always the most secure when it comes to the case being dropped or jostled severely. Sleek black leather portfolio with a small tab at the bottom for easy opening. Side view of the rounded, seamless spine which is very comfortable to hold. Top view of the Z-Case showing well-stitched seams and riveted construction. The Targus Z-Case is also extremely well-constructed. Every stitch on this case was perfect and I thought that the rivets on both the top and bottom of the Z-Case added a durable, yet sophisticated touch. The interior lining was made from a slightly padded, soft blue material which would definitely not scratch the screen of your iPad. Unlike cases which close using zippers and which often are also a tight fit, the size and interior lining material of the Targus Z-Case ensure that your iPad slips easily both in and out of the case for quick access. How do you keep your laptop or iPad protected when you travel? Is there a product out there that you would recommend? 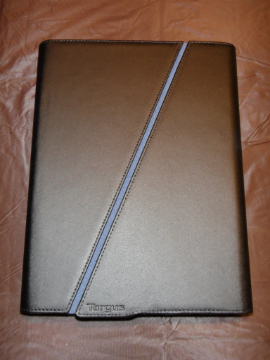 Disclosure: I received the Z-Case Leather Portfolio for iPad from Targus, Inc. in order to facilitate my review. No other compensation was received. This product review is based on my own personal experiences with this item and is completely honest and objective.